Bring your camera and your trekking poles for Friends of the Smokies’ day hike to LeConte Lodge. The July 11th Classic Hike of the Smokies is 10 miles, out-and-back and climbs 2,600 feet up the newly rehabilitated Alum Cave Trail. Come along and see the latest projected completed by Trails Forever, a partnership between Friends of the Smokies and Great Smoky Mountains National Park that supports trail restoration in the park. 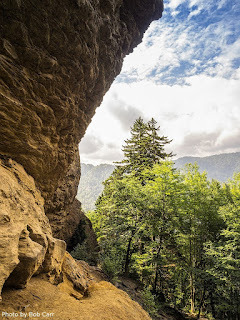 One of the most iconic trails in the Smokies, Alum Cave is one of five routes leading to the top of Mt. Le Conte, the third-highest peak in the Smokies. At a one-way length of five miles, it is the shortest of the trails to the top, and has interesting features such as Arch Rock, Alum Bluffs, and the Eye of the Needle on Duck Hawk Ridge. The group hike will include stops at Cliff Tops with its long-range views, and LeConte Lodge, before returning on the same trail. Hike leader Steve Pierce has hiked all the trails in the Smokies. He also leads hikes for the Carolina Mountain Club and the McDowell Trails Association. Monthly guided day hikes in the Classic Hikes series are $20 for members. New and renewing members may join Friends of the Smokies and hike for $35. Donations benefit Friends of the Smokies’ Trails Forever program, which provides the opportunity for a highly skilled trail crew to focus reconstruction efforts on high use and high priority trails in the park.